There is a lot of cool subway art available these days. I love the look of the words, lined up and perfectly fitting the space. I wanted something for my home that was a reflection of us, our family. We have lived in 2 countries, 4 states and moved 7 times in our marriage. That's a lot of address changes!! I decided to create a personalized subway sign that showcased some of our addresses. 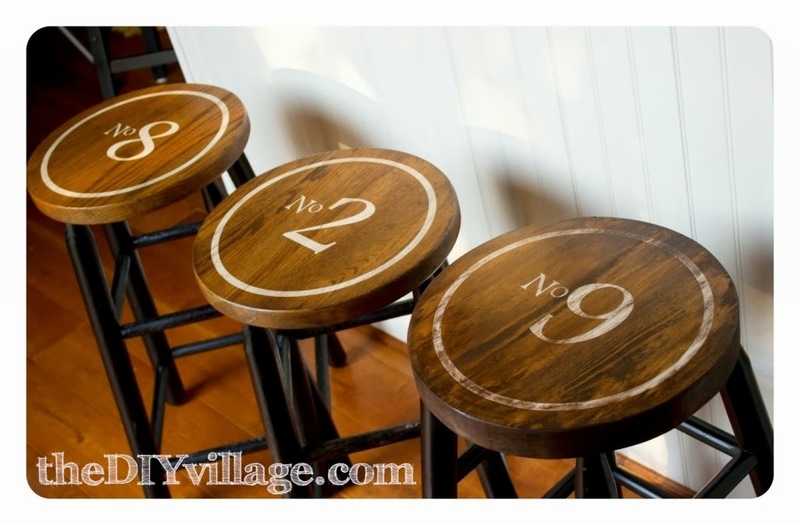 My inspiration piece was this great stool makeover by the diy village. I really like the richness of the wood, combined with the painted numbers. Mr. DIY is great at helping me problem solve. I come up with the great idea, he figures out a way to help me pull it off! I created the template for my sign in Open Office, but I'm sure Microsoft Word or any word processing program would work as well. I adjusted my fonts so they would fill up my document. I think I used 3 different fonts, variations of Arial, but kept them close enough in style so it wouldn't be too hard on the eyes. I had to play around a bit, varying the heights and sizes, making adjustments until it fit just right. Once it was created, I printed it out. Then I went "old school" and used a projector (that Mr. DIY brought home from work). 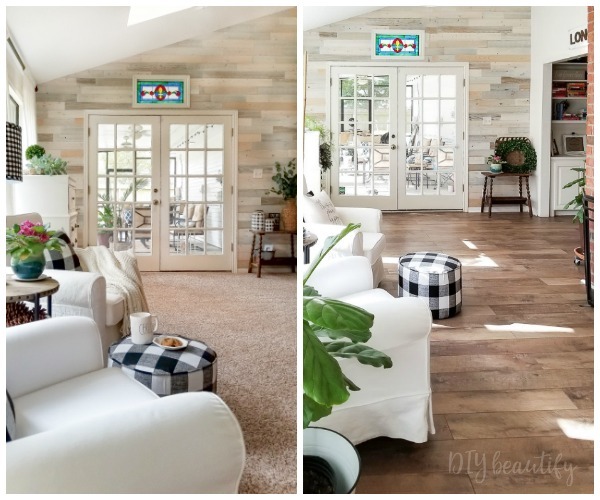 I had an old piece of plywood sitting in our garage that was perfect for this project. I leaned my board on a bench against the wall, and projected the image onto it, adjusting until the image was centered on my board. I then spent 3 hours on my knees hand painting the lettering. Not for the weak-kneed, I tell you! The original plan was to pencil in the projected image, then move the sign to a comfortable work surface and fill the words in with paint. However, I soon realized that would basically require me to double my work. So I decided to just get started painting and see how it went. Once the paint dried, my plan was to stain the whole piece, then wax and be done. Yeah, things kinda went south from this point. My wood was a piece of cheap plywood, not furniture-grade like my inspiration piece. Using dark stain doesn't mean you're going to get a nice, even finish. Never having done a project like this, I was astonished to see the dark striations and grain that was revealed when I stained it. I tried to like it, but it looked bad. You couldn't really read some of the words, it was that bad. some of the paint. Which ended up not being a bad thing as it looks more antiqued and distressed that way. After sanding and wiping it down, I gave the whole thing a gray wash (gray paint diluted with water). This filled in a lot of the cracks and grooves and helped soften the tone somewhat more. I waxed it and it's now hanging in our family room where it gets noticed by everyone who visits. 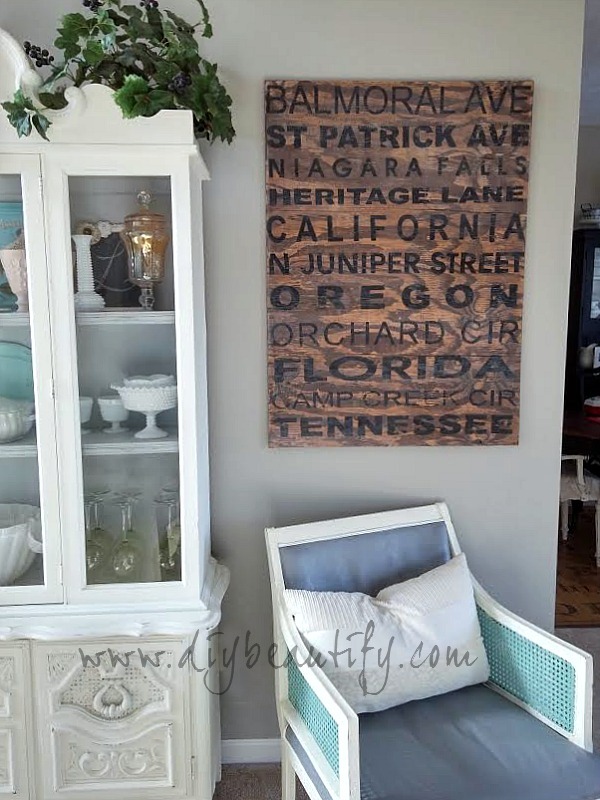 It's a wonderful conversation-starter, and I love the distressed look now. Our family is 22 years old, and this sign is a reflection of that. It's aged and beautiful! It's also a great reminder to our kids of the path our lives have taken up to this point. 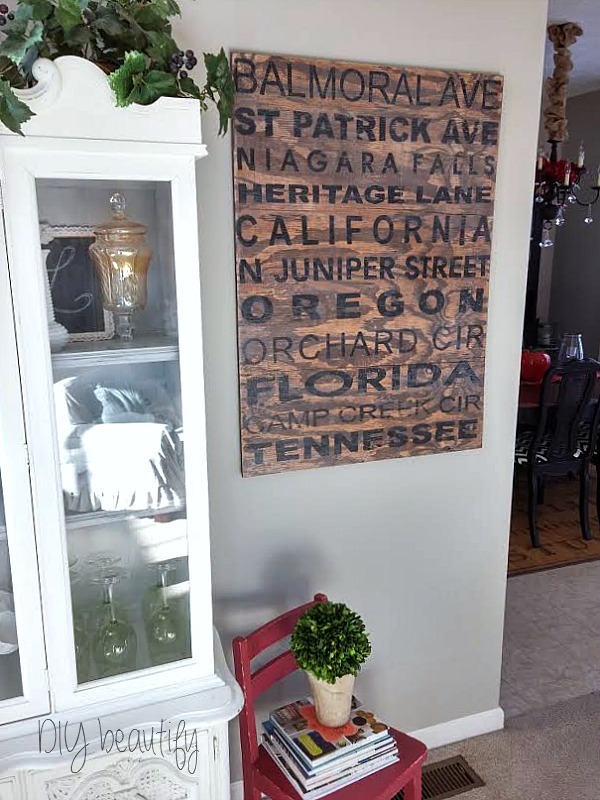 They were each born in a different state (one in a different country - Canada), so their lives are represented on this sign. Not all projects go as planned, and you may need to just roll with it and try something new. You just might be surprised with the end result....it may be even better than you imagined! I loved this when I was at your house. It's a fantastic idea! This turned out fantastic! 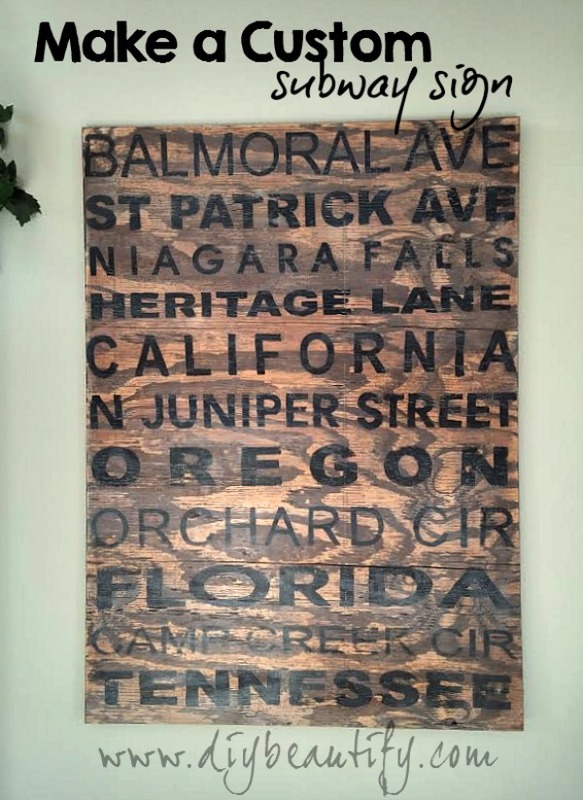 What a great way to showcase some of the places you've called home. Thanks for sharing at Weekend Wander this week! I really like how it turned out! 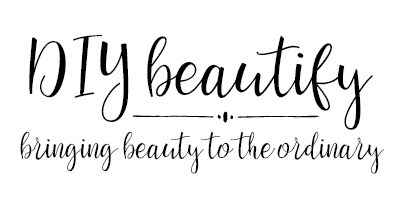 It looks lovely in your home! 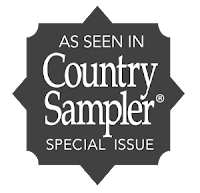 Thanks for sharing this post on Tickled Pink Times Two! I love how this turned out! 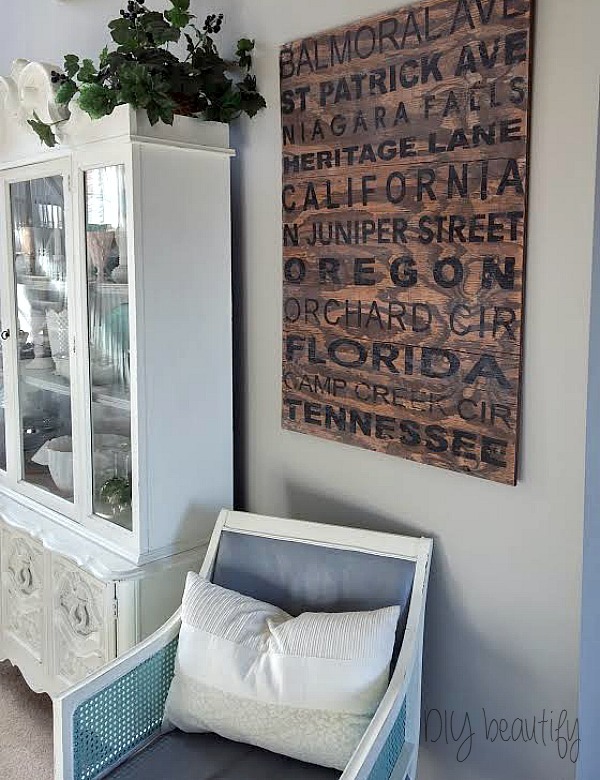 What a neat personalized piece to have in your home! 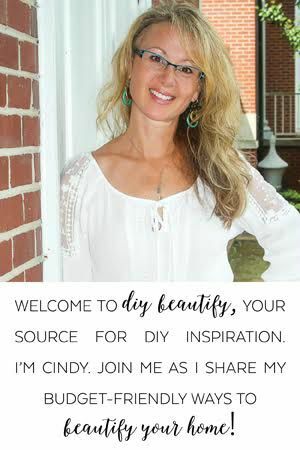 Thanks so much for sharing this at Get Your DIY On! Hope to see you on Sunday with your spray paint projects! Have a wonderful day! 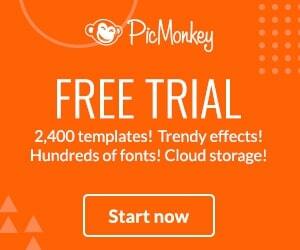 What a great idea to keep memories ! Love it. I was thinking to make the same things with all the States that we've been visited with my husband. Great job ! have a wonderful weekend ! Yes, you totally should make one!! 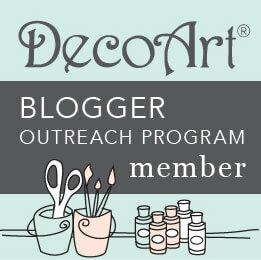 Thanks for visiting :) I'm looking forward to checking out your site too! WOW...super duper sign...LOVE IT! You will be featured on Monday at this weeks party. Love this!!! What a great way to display all those memories. Thanks for sharing at Throwback Thursday. I think it turned out great! Thanks for sharing at Throwback Thursday. Fabulous Personalized Subway Sign as Artwork. I would like to thank you for the efforts you have made in posting those nice picture.You really did a great job on posting.